Condo, 3 Bedrooms, 2 Baths (Sleeps 6-7) MONTHLY ONLY! This condo has just been remodeled and is the perfect vacation condo with style, flair, beauty, beach, heated pool, Jacuzzi, a fabulous view of the Gulf of Mexico (we are on the 2nd floor), and the most beautiful sunsets in the world! You will love this gorgeous, luxury 3 bedroom condo and it is right on the beach. Spacious and private and just tastefully remodeled. The condo sleeps 6 with 3 bedrooms; huge master suite with Kind bed, 2nd bdrm Queen bed and 3rd bdrm 2 twin beds, 2 full baths, spacious living room & dining room. The condo is modern with beautiful beachy furniture, a fully equipped, newly remodeled kitchen with granite countertops, all new stainless steel appliances and of course, a washer & dryer. 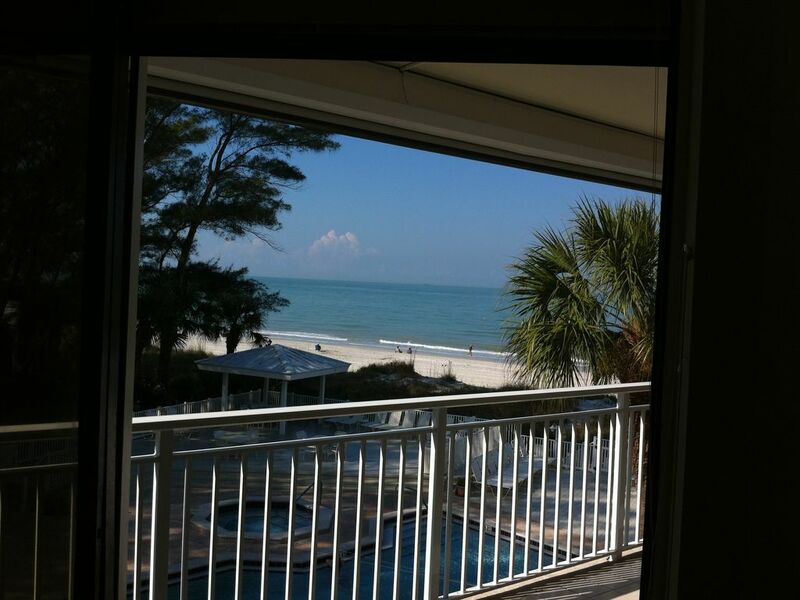 You can see the beach and the water from the balcony, master bedroom, and living room. The balcony will be your haven – a beautiful view, soft breezes, you can have your breakfast on the balcony, wine at sunset…and during the day if you don’t feel like going down to the (heated) pool or beach, just lounge and get your tan right on the balcony….perfect! The Pool is large and heated with a hot tub/spa. The pool deck has many lounge chairs, tables, bistro tables & bar stools, a gazebo and gas grills. Everything is in top condition. The access to the beach is private and a reserved covered parking spot for you. There is a FITNESS ROOM and sauna. There is a cable TV and high speed internet with Wi-Fi. The fully equipped kitchen has; washer/dryer, dishwasher, toaster, coffee maker, oven and stove, refrigerator & freezer with filtered water and ice maker. All linens & towels provided, lounge chairs, tables and gas grill at pool deck. Reserved covered parking spot, elevators and guarded entry. We have owned this condo for 30+ years and love the access to the beach, views and location. We have just finished a complete remodel, so the condo is brand new for your enjoyment. There is a brand new kitchen with granite countertops, as well as new bathrooms with beautiful new tile and vanities. There is new tile throughout the condo and new paint for a fresh and beautiful condo. BRAND NEW remodel. Everything is new. Be the first to enjoy this new, beautiful condo. right on Indian Rocks Beach. Beautiful white sand at your door. Complete set of dishes, pots, pans, silver wear, utensiles, etc. Brand new kitchen with new cabinets, all stainless steel appliances, granite countertops and double sinks. Indian Rocks Beach is a beautiful, white sand beach away from the crowds. There is limited public parking in the area, so the crowds are minimal. Yet, you are close to Clearwater Beach and St Pete Beach if you want more activity on occasion. Also, Tampa is a short 20 to 30 minute drive, so access is easy.